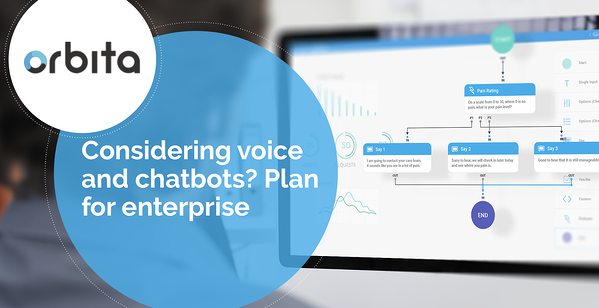 Last week, we hosted a webinar titled Considering Voice and Chatbots? Plan for Enterprise. It is available for replay on-demand here. We fielded excellent questions from individuals spanning professions across many types of healthcare organizations. Thanks to all who participated! "Loving the concept of the AI chatbots as a conversational portal into an organization, network, etc. No more searching websites, calling the wrong extension, having the right person be unavailable, etc., etc." I suspect one of these individuals is more technically entrenched while the other is more focused on the business value proposition for conversational AI to solve common frustrations among today's patients and consumers. During our Orbita-hosted webinars, most questions focus on real-world applications of virtual assistants — what are today's most common use cases (customer service, clinical, other?,) how does a virtual agent deliver care protocols?, etc. On the technical side, we most often get questions about security, multimodal capabilities (text, voice, video, etc.,) integration with EHRs and other systems, etc. This wide range of inquiries reflects today's reality of an early and rapidly maturing market. 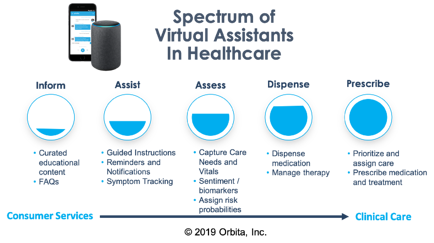 We see varying degrees of understanding and adoption along what the Orbita team has dubbed the Spectrum of Use for Virtual Assistants (see graphic.) We're excited to work with our customers and partners to blaze this new trail. Considering Voice and Chatbots? Plan for Enterprise. Thank you — and I wish you the best in your voice and chatbot endeavors! 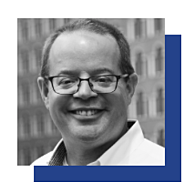 PS: Some attendees of last week's webinar requested information about Orbita's partner program and about our support for white label experiences. To learn more, please contact us: www.orbita.ai/contact-us or  hello@orbita.ai or ( +1)617-804-5550. "Healthcare reformation is upon us and we all must prepare. 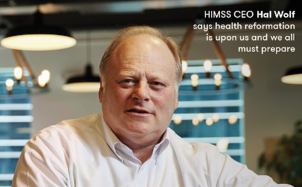 Fortunately, the industry is realizing the capabilities of digital health tools that facilitate better patient experiences and reimagine care delivery, making it more efficient, convenient, globally delvers and safer." A Q&A article with industry experts from leading academic institutions included our own Bill Rogers. Panelists agreed that artificial intelligence and virtual intelligence are at the core of the user-focused future of healthcare. "Today’s nurses, physicians and other providers routinely perform mundane tasks (administrative responsibilities, follow-up phone calls, etc. ), which limits their time with patients. Voice- and chatbot-powered virtual assistants, including those that leverage AI, can provide a streamlined experience by automating many of these tasks." Experts from Cleveland Clinic highlighted the value of distance health technologies for their organization, and the American Health Information Management Association (AHIMA) contributed an article on the importance of accuracy across a patient's health record especially as today's digital health solutions capture data in radical new ways. Thanks to our friend John Nosta of NostaLab, for his article titled For Digital Healthcare Innovation, Collaboration is Key. See the complete issue of the USA Today insert. We encourage you to add your "voice" to this discussion. Send us your ideas at hello@orbita.ai. How are you getting started with voice and chatbots? Kristi Ebong, Orbita SVP of Strategy, will be at this new event. Want to meet Kristi? Send her an email or connect with her at LinkedIn. Attending this event and want to learn more about digital engagement strategy and conversational AI solutions? Schedule a meeting to talk with someone from the Orbita team – here! Call for speakers due April 1; Orbita will exhibit! Voice Summit AI, July 22-26, 2019: Orbita is a gold sponsor! Voice of Healthcare Summit, August 5-6, 2019, Boston: Orbita is a sponsor! HLTH: The Future of Health, October 27-30, 2019, Las Vegas: Orbita will exhibit!